The Monk Joannicius the Great was born in Bithynia in the year 752 in the village of Marikat. His parents were destitute and could not provide him even the basics of an education. From childhood he had to tend the family cattle – their sole wealth. Love for God and prayer completely held sway in the soul of the lad Joannicius. Often, having shielded the herd with the sign of the Cross, he went to a secluded place and spent the whole day praying, and neither thieves nor wild beasts came near his herd. By order of the emperor Leo IV (775-780), a multitude of officials spread through the cities and towns to draft fine young men for military service. Young Joannicius was also drafted into the imperial army. He earned the respect of his fellow soldiers for his good disposition, but also as a brave soldier and fierceness to enemies. Saint Joannicius served in the imperial army for six years. More than once he was rewarded by his commanders and the emperor. But military service weighed heavily on him, his soul thirsted for spiritual deeds and solitude. And the Lord summoned His servant to Him for service. By chance encountering his former companions from military service, the saint quit the wilderness and withdrew to Mount Konturea. Only after twelve years of ascetic life did the hermit accept monastic tonsure. The saint spent three years after the tonsure in seclusion, wrapped in chains, after which he set off to Chelidon to the great faster Saint George. The ascetics spent together three years. During this time the Monk Joannicius learned by heart the entire Psalter. Having gotten up in age, the Monk Joannicius settled in the Antidiev monastery and dwelt there in seclusion until his end. 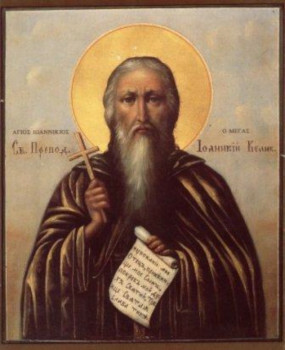 The Monk Joannicius spent seventy years in ascetic deeds and attained to an high spiritual perfection. Through the mercy of God the saint acquired the gift of prophecy, as his student Pachomius has related. The monastic elder during the time of prayer hovered over the ground. One time he traversed a river flooded to overflowing. The saint could make himself invisible for people and make others invisible: one time the Monk Joannicius led out from prison Greek captives under the watch of a crowd of guards. Poison and fire, with which the envious wanted to destroy the saint, did him no harm, and predatory beasts did not touch him. It is known, that he freed the island of Thasos from a multitude of snakes. The Monk Joannicius likewise saved a young nun, who was preparing to quit the monastery on a whim to marry; he took upon himself the agonised maiden’s suffering of passion, and by fasting and prayer annihilated the seductive assault of the devil. Foreseeing his end, Saint Joannicius expired to the Lord on 4 November 846, at the age of 94. Previous Previous post: Science of the Saints, 16-XI-2018 (3 Nov.), Martyrs Akepsimos the Bishop, Joseph the Presbyter and Haiphal the Deacon.